we really enjoyed the homemade baked mocha cake doughnuts that we made a few weeks ago. since we bought a doughnut pan for that recipe, we decided that we better put it to good use and make another batch of homemade baked doughnuts. i mean, you can't just let a perfectly good doughnut pan go to waste. 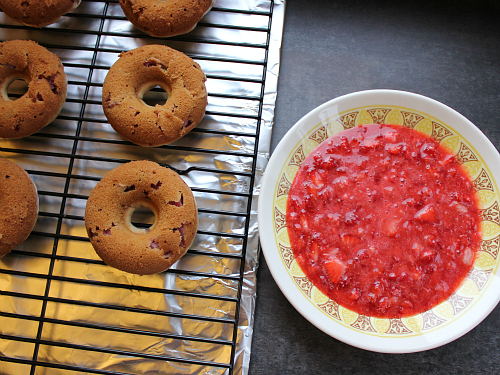 this time we decided to make strawberry doughnuts. just like our mocha cake doughnuts, these strawberry cake doughnuts are baked, not fried, which means that they are not greasy like fried doughnuts. instead, they are light and fluffy like little cakes. 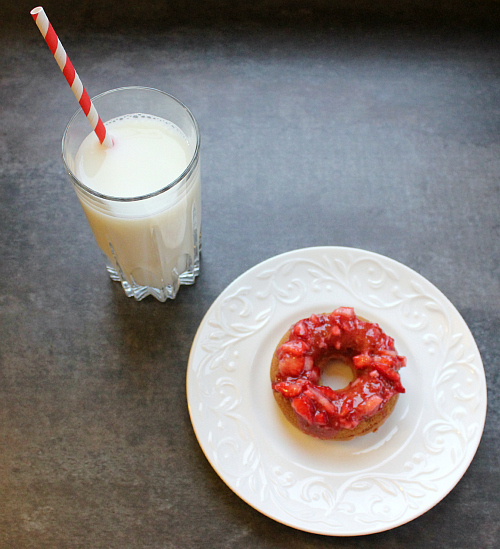 these doughnuts have strawberries inside and out. 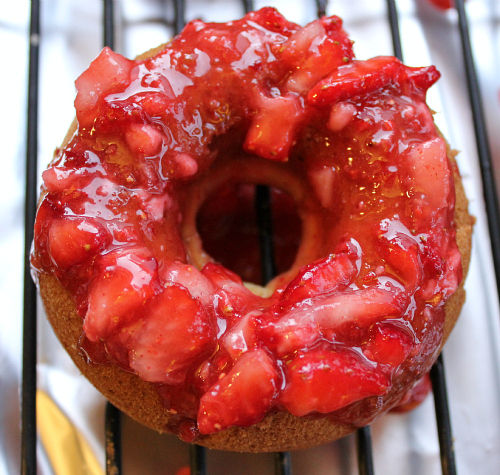 there are sliced strawberries inside of them (which reminds me of strawberry pancakes from my childhood) and there are strawberries in the glaze on top of them. it's the perfect marriage of doughnuts and fruit. that means we can feel a little bit better about them because they have fruit in and on them, right? also, they're pink! what's not to love about that? 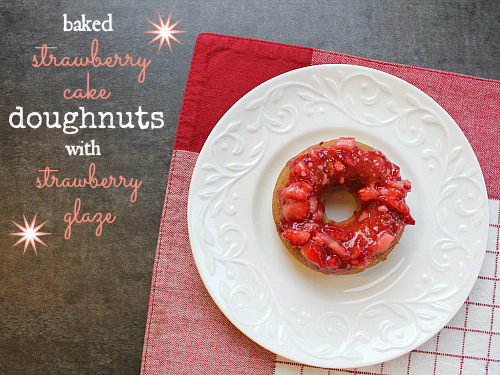 these doughnuts are so simple and so easy to make. it may be dangerous just how quickly a batch of these guys can be whipped up! hello, beautiful . . .
to make the doughnuts, preheat your oven to 375 degrees F. in a large bowl, whisk together the buttermilk, oil, vanilla, egg and sugar. sift the flour and the baking soda into the batter and stir well to combine. gently fold the strawberries into the batter. spoon the batter into a greased and floured doughnut pan. 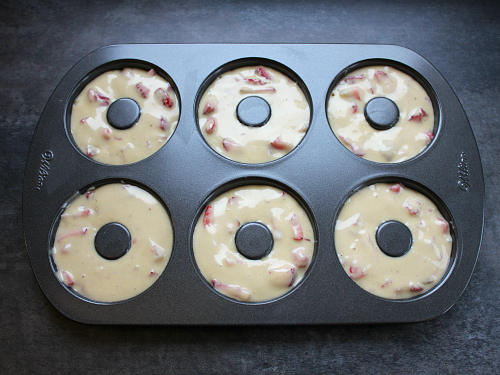 bake for 11-12 minutes, or until the doughnuts spring back when pressed lightly. once baked, allow the doughnuts to cool in the pan for 2 minutes, then carefully remove them from the pan and allow them to cool completely on a wire cooling rack. 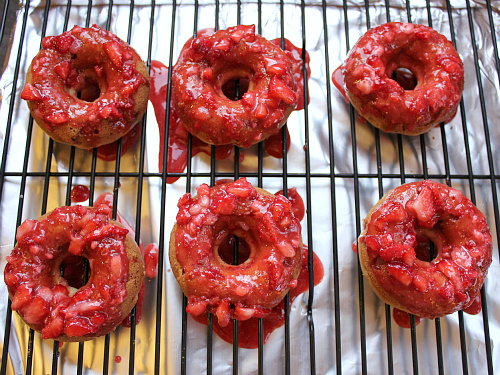 Strawberry shortcake donuts. What a clever idea. I am not a donut fan because they are greasy but these definitely are not. Plus the fruit inside and out adds flavor and texture. I want one. I also want to hug the furry one. What a great idea, those looks delicious! 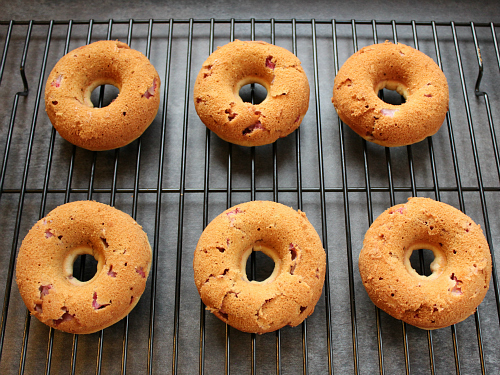 This recipe is just convincing me even more that I need to get myself a donut pan asap! :) Looks amazing, Laurie! woh woh woh Laurie, you just took donuts to the next level. These look awesome! I think I may need to go buy myself a donut pant!